* To minimise oil impurties in the air. * To reduce accidents due to slippery floors. * For keeping machines; floors, walls, roofs, clean thereby reducing cleaning costs. * To reclaim oils and coolants which might go inwaste. * To increase productivity with healthy working conditions. Mist Extractor is having dynamically balanced impeller open at one end; having perforated sides and is directly driven by electric motor. When the unit is on; it draws mist alongwith air. Due to higher velocity - 390M/ Min; the mist particles are forced to collide and coalesce before being thrown by centrifugal forced against, inside surface of mist extractor. 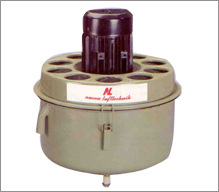 Through outlet provided on mist extractor, the liquid collected is drained under pressure. The filtered air is returned into the department. Irrespective of the period of use the mist extractor maintains the same high cleaning effect. Special care has been taken to reduce noise level. The mist extractor filters finest particles even upto 0.2 micron; which normally might have gone into the atmosphere. These smaller particles are hazardous to human body. As the natural filter in human system are not capable of filtering them. It is therefore necessary to have them filtered out by artificial means.